I made the floral crown myself! It was so fun and easy, I’ll have to make more of them some time in different colours. I picked up the dress from Zoo Emporium for only $10! It was in a massive pile of other clothes and I dug it out from the bottom along with a wedding dress I tried on that was so heavy it took at least 15 minutes just to get over my head. And my black rose ♡ the costume is not complete without it. Wow, once again.. great costume! I love all the white with the contrast of the black nails, that looks amazing. I'm a big fan of the make up again. You look AMAZING! 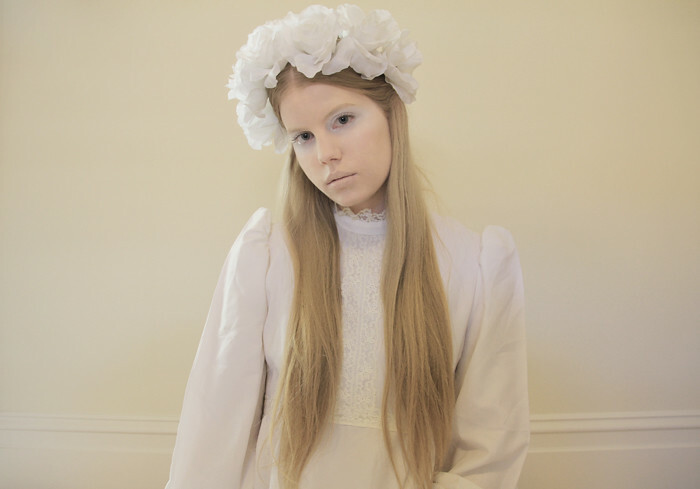 Gah, you really do look ghostly and fairly like and like you just stepped out of the version of Picnic at Hanging Rock where they're all in heaven? Idk it's perfect. What a lovely Halloween outfit! I am literally like this now: *___* And I am so happy I discovered your blog! Your photos and outfits are gorgeous! I love reading your posts!! really nice i'm in love!